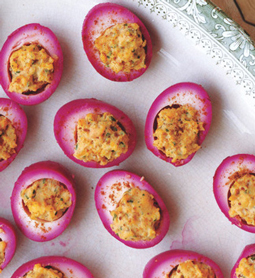 Beet-Pickled Deviled Eggs - A recipe from Savor California, the online showcase for extraordinary gourmet foods and beverages from California. Bring water, vinegar, beet, shallot, sugar, bay leaf, and 1/2 teaspoon salt to a boil in a 2-quart saucepan, then simmer, covered, until beet is tender, about 20 minutes. Put beet mixture in a container with eggs and marinate, chilled, gently stirring once or twice, at least 2 hours. Finely grind caraway seeds in electric spice grinder or with a mortar and pestle. Remove eggs from beet mixture and pat dry (discard beet mixture). Cut in half lengthwise and remove yolks. Mash yolks with mayonnaise, mustard, parsley, and half of caraway. Season with salt and pepper. Divide yolk mixture among egg whites. Sprinkle with remaining caraway. Eggs can be marinated, chilled, in an airtight container up to 3 days.